Do we teach ‘intelligence’ or is it something we release, nurture or coach into existence? Don’t know – and not too sure there is just one answer. But I am sure there are techniques we can practise repeatedly with students that, if they internalise and are able to reproduce from habit, can make their writing, speaking and – yes – thinking demonstrate more sophistication and subtlety. In my book that’s demonstrating more intelligent application. Our students are delighted to explain how, in English lessons, they are encouraged to PEE all over the page (Point, Evidence, Explanation). Well in our Geography lessons we’ve tried to move away from toilet mnemonics to a more artisan CRAFT technique. This lends itself to the extended opinion-based questions at GCSE in which students are required to consider alternative options to manage an issue. What is less clear from the question phrasing is that for a high-band mark the answer needs to consider the issue from both sides before justifying a preferred option. We start developing a structure for this at KS3 to score a channel for the thinking. One of the units in which we introduce this approach is our Y9 study of the changing Arctic. 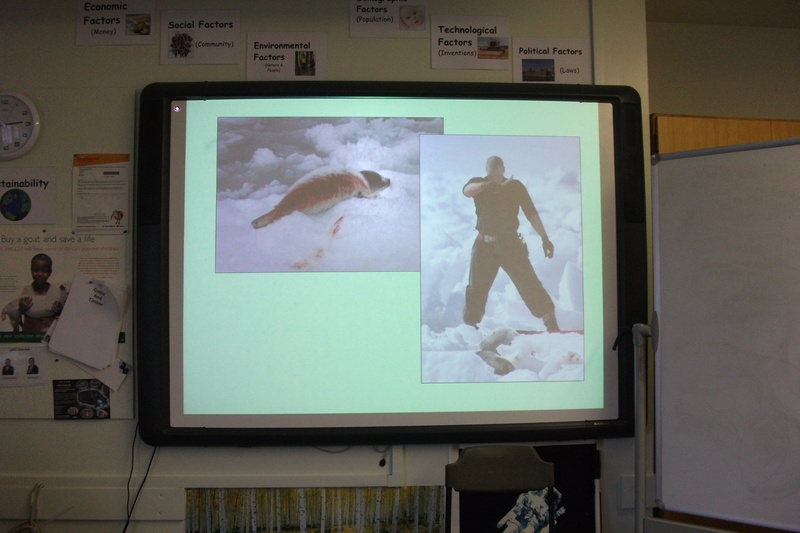 The issue of commercial seal-hunting for the fur-trade hits a number of emotional response buttons with the students and sometimes you have to work at getting them to appreciate that there might be valid arguments for clubbing the brains out of a month-old seal pup. (There are always a few who enthusiastically trend to this perspective from the start; I do worry about them). 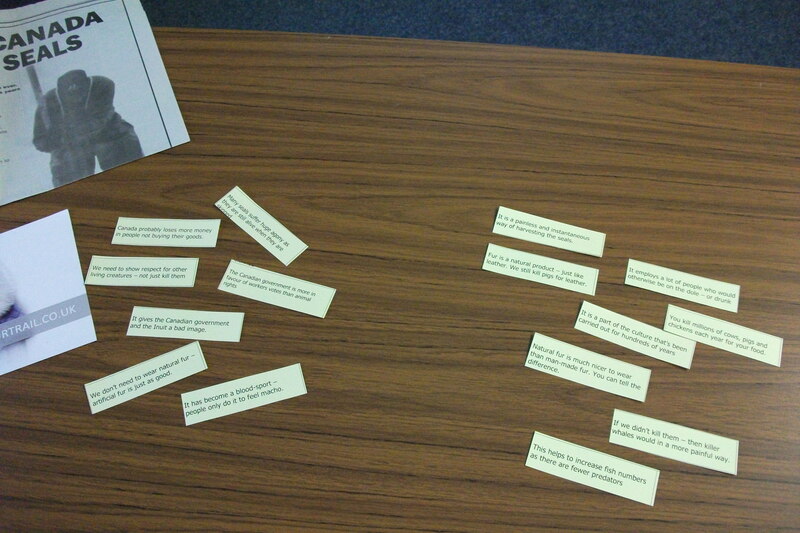 We start with a card-sort of pre-prepared points ‘for’ and ‘against’ seal harvesting. Working in pairs students divide the cards into two groups. Some are more obvious – others require clarification through discussion and pairs are encouraged to seek insight from those around them for the more the political-statement cards. Those finishing rapidly are encouraged to further classify their two groups into arguments that are ‘economic’, ‘social’, ‘political’ and ‘environmental’ by putting a colour-code onto the cards. 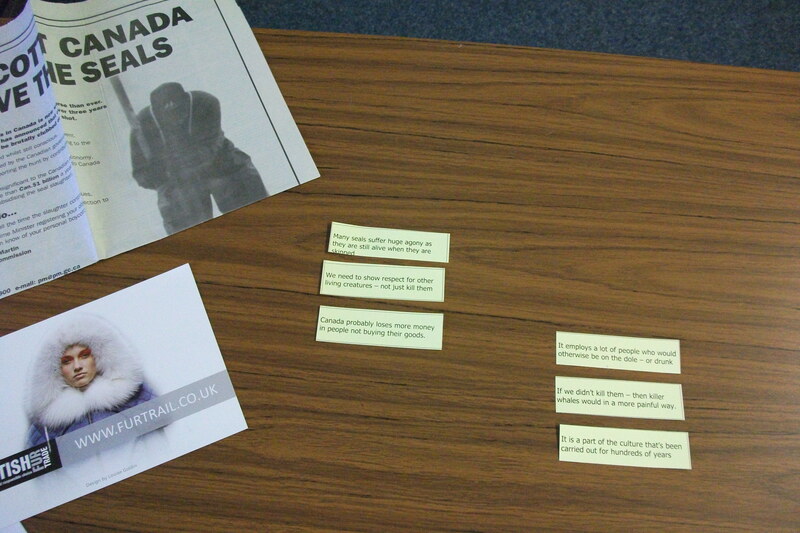 The cards in the two groups are then rated by students for their ‘power of argument’. The more persuasive points are put at the top and ranked down to least persuasive. There is little need to encourage discussion here as students weigh up the points that speak most forcefully to them in their pairs. A review of this stage can focus on what makes a more powerful point. Is it the depth of the impact (emotional gut reaction to this method of animal culling), scale of impact (lots of people affected), or likely linked consequence (international trade bans)? There is a hierarchy of thinking here that can help you gauge what level of response each pair is working at. Students need to retain the top 3 cards in the two lists – they can put the others to one side. Which side of the argument do you agree with most? 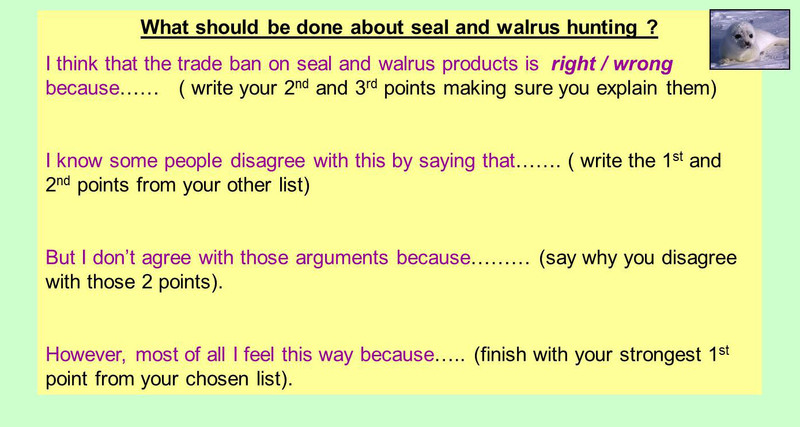 Students need to put aside their initial reactions to the images and clips of seal harvesting and decide which set of arguments they are going to argue for – and which against. They need to be able to articulate their selection and say why, with three cards on either side, they feel one set of points lies more in accordance with their views than the other. This will form the basis for their discursive writing. With the earlier coding of the cards students can explain whether they are being persuaded more by ‘economic’ arguments than ‘social’ ones… or any of the other permutations. Frame the argument. At KS3 we use a writing-frame to structure the response and discuss how a persuasive piece of writing frequently uses the same elements. It starts by asserting the position of the writer; justifies the position with coherent arguments; acknowldges alternative opinions; challenges and criticises those opinions; and finishes with the most persuasive point left in the armoury. The big-bang finish. The hardest part students encounter in this stage is working out justifications for the points they ‘disagree’ with. 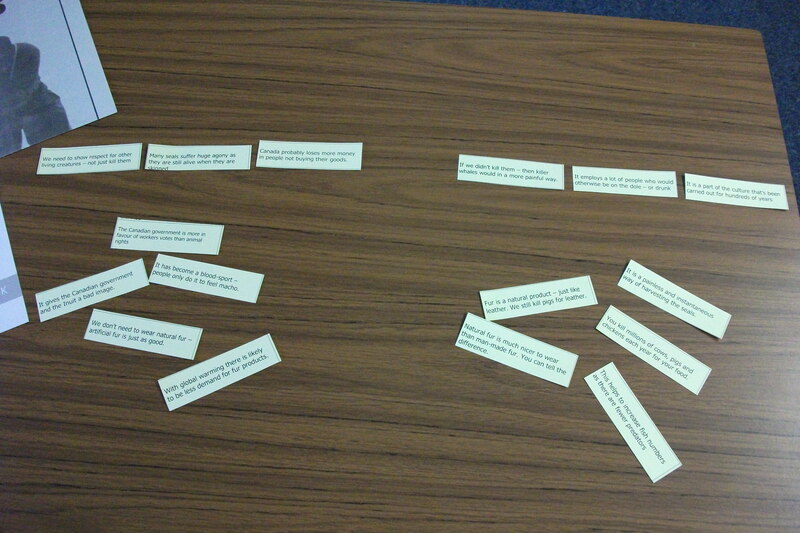 This is why the writing frame only asks for two alternative points to be given when students have previously selected three cards – they can choose the two they can best find a convincing point to justify (that they don’t agree with). Test out the power of the arguments. Once students have drafted their discursive piece select students to listen to – and respond – to various students’ lines of argument. I’ve tried this with a PPPB Q&A review – Pose the challenge of finding their strongest argument but think about why someone else might criticise it, Pause for thinking time, Pounce on a student, then Bouce it to someone else (often of their choice) to react. The ‘bouncee’ can use the ACE technique to respond: (Accept the argument but say why, Comment on the argument further, or Explain/Expand the point). On other occasions I’ve put those ‘in favour’ of seal harvesting on one side of the room, ‘against’ on the other and they ping-pong the debate backwards and forwards – criticising the previous point by the opposition group before asserting their own argument. A third group of students act as jury to vote on which side best defended the criticisms made of their arguments and landing most significant ‘hits’ on the other side. Using this as an interim between the drafting and the final version – it allows students to add to their arguments, change their rankings or even change the perspective they wish to pursue. It makes the final discursive written piece stronger and helps weaker students find a range of reasons they feel comfortable writing about. I’ve rarely failed to be impressed where students take their thinking and quality discursive written answers when encouraged to follow this template. As in all things – it’s about practice, practice and more practice until it becomes automatic – they rehearse organising their platform of strongest arguments, defending their position, second-guessing the criticisms, and preparing their evidence to undermine contrary views. And if any students baulk at the thought of repeated practice of any useful technique (if?…when!) – then consider showing them what repeated practice can do. Thanks due to my great department colleague @BryonyShelby who has been showing her GCSE groups what dedicated practice does for the All Blacks……simply amazing. Faculty BBQs are going to be something else this summer.